Have a question on Duster? Duster is available in 9 different colors - White, Orange, Beige, Mercury, Comet Grey, Navy Blue, Cosmos Blue, Pearl Black and Mink Brown. Bringing a sort of revolution in the segment of compact SUVs, the Renault Duster has been a runaway success in most of the emerging markets, given the fact that the Duster has hit the sweet spot with its entry scheduled at a time when the compact SUV market was just beginning to bloom. Derived from Renault’s sister concern Dacia, which is well known in Europe for making budget oriented vehicles, the Duster from Renault has been tweaked to make it plusher and more equipped in terms of comfort and convenience features. 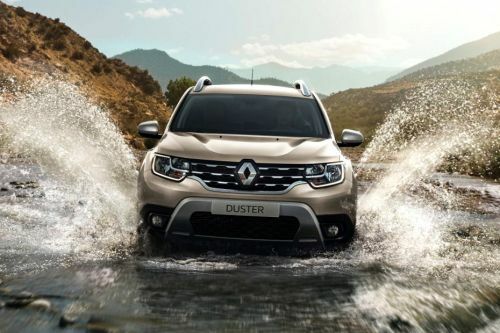 The prices for Renault Duster in UAE start at AED 57,015 and is being offered in six colors – Glacier White, Mercury, Mineral Blue, Olive Green, Ice Brown, and Pearl Black. On the inside, the Duster carries its simplistic approach in its design and lacks the levels of sophistication that the compact SUVs of similar size are now possessing. Nevertheless, it is still a notch above the cabin of the previous iteration and somehow manages to look decent with its overall layout and dual tone black and beige theme. The three-spoke steering wheel with small buttons for audio and Bluetooth behind it could have been better styled in terms of ergonomics and design, however, the three pod instrument console with chrome garnish look neat and premium. The centre console looks long and vertical, with the upper variant featuring a simple 7-inch touchscreen infotainment system, which comes inbuilt with reverse camera and navigation. However, the lack of several common features associated to premium vehicles of its sorts, such as automatic climate control, rear AC, cruise control, telescopic adjustable steering wheel, and electric adjustment for driver’s seat, make the Duster feels spartan and lagging behind in the competition. The build quality too feels questionable at many places. However, the one area where the Renault Duster scores full marks is the amount of space on offer. The leg-, shoulder-, and head-room in the Duster are generous enough to seat five passengers with ease. The humongous 450-litre boot is commendable. SUVs need to look proportional on the outside to have that impressive road presence, and the Renault Duster, even with its compact dimensions, looks smart, thanks to noticeable design elements typically associated with large SUVs. Starting from the front, the Duster has got a huge and wide chrome finished two-slat grille with a large Renault logo placed in between. Flanking this wide grille are two large headlamps which are nicely designed with unique partitions within it. However, the lack of LED or projector elements can be felt, considering the fact that smaller cars are now coming with this much-hyped feature. Moving on the sides, the Duster carries on its muscular persona, and though it lacks any character lines, the husky haunches above the wheels look purposeful. The old-school pull-back levers for door handles as well as fender mounted turn indicators look out of place on a car of this size, though. However, the diamond cut alloy wheels and side cladding add a dash of style to the otherwise simply styled side profile. At the rear, the small and vertical LED tail lamps with adjacent bulges on the rear hatch, along with chrome embellishment above the number plate housing, look neat and add some premium feel to the rear profile of the Duster. The silver finished skid plates at the front and rear bumper, as well as large roof rails, make the Duster look rugged and stylish at the same point. This is one department where the Renault Duster really shines through. While both the 4x2 as well as 4x4 versions get MacPherson type with rectangular lower arm and anti-roll bar at the front, the former gets a flexible axle with programmed deflection suspension and spiral springs at the rear, while the latter gets sturdier MacPherson multilink suspension at the rear. The suspension settings are set at just the right spot, with the Duster feeling neither too stiff nor too soft. In the 4x4 version, the Duster gets drive mode selector, with 4x2, Auto and 4x4 lock modes to get the best use of torque on wheels as and when required. For the UAE market, where the performance is given a higher significance over fuel economy, the Renault Duster gets the sole option of a 2.0-litre four cylinder petrol motor, which is the biggest engine a Duster gets globally. The engine is punchy enough to produce a maximum power output of 135 bhp and a peak torque output of 195 Nm. The engine is mated to a 4-speed automatic in both the 4x2 as well as 4x4 versions, with the torque converter getting long throws to make the best use of the torque available on the spread. For an SUV of this segment, the Renault Duster could have been freely passed with flying colors in the department of safety features. However, it is quite surprising that the Duster features just the basics of safety gears and misses out on a couple of other sophisticated electronics which its international versions do get. The UAE-spec Duster mentioned here features dual front airbags, ABS, reverse sensors, ISOFIX mounts, speed sensitive door locking, tyre pressure monitoring system, and electronic stability program. The Renault Duster might not feel polished and premium at many places, for the lack of many contemporary features and questionable build quality hampering the overall package. However, the areas where the Duster really impresses one are the comfortable ride quality, massive space on the inside, and decent performance from the 2.0-litre petrol motor and 4x4 system. This makes the overall vehicle a good performer which covers the basics of the vehicle in a right way. And given the price at which it is being offered, there is no other SUV with the same levels of mechanical finesse of the Duster. It is difficult to live with a large vehicle which is not so premium in terms of design and features, but if you can, the Duster is a very well rounded package in terms of mechanical aspects. What are the colors options available in Renault Duster?